A sixth person has been charged after police made a £3.2million drugs bust in Peterborough this week. 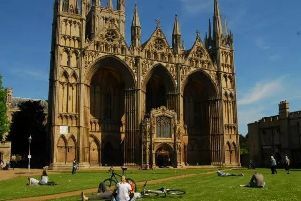 Caetano Valentim Manuel Pinto, 28, of Mountbatten Way, Peterborough, has been charged with conspiracy to supply and was due to appear at Peterborough Magistrates’ Court today, Friday October 20. Anthony Sinclair, (19), of Bedford Road, London, Samson Ogbeni, (26), of Colebrooke Row, London, Shahim Daryani, (29), of Storksmead Road, Edgware, Anna Manolau, (21) of Grange Road, Peterborough and Olsi Plaku, (25), of Grange Road, Peterborough all appeared at Peterborough Magistrates’ Court on Wednesday. They were all charged with conspiring with each other and unnamed others to supply 314kg of cannabis in Peterborough. Ogbeni was also charged with dangerous driving, involving a white Vauxhall Vivaro van on Oundle Road. None of the defendants entered a plea to the charge, and there were no bail applications made. They were all remanded into custody until November 14, when they will appear at Peterborough Crown Court for a preliminary hearing. They will appear at the court via video link. The six were arrested following a police raid on Monday night. Residents in Beluga Close on the Vista Estate in Fletton reported police searching for a man at 10pm. A van was recovered by police. Drugs were also found at an address in Grange Road, Peterborough.